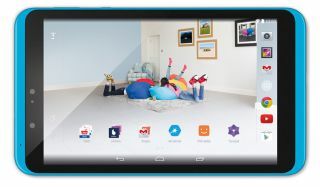 Tesco unveils Hudl 2 tablet | What Hi-Fi? Tesco has released the successor to its Hudl tablet, the predictably named Hudl 2. It promises to offer a better all-round performance while still keeping the same affordable price tag. Tesco claims to have upgraded almost every aspect of the Hudl 2 compared to the original Hudl. It now features an 8.3in Full HD display as well as "Dolby-optimised" audio. A 1.83GHz Intel Atom quad-core processor with 2GB of RAM should keep processes running smoothly, and the Hudl 2 comes running Android 4.4.2 Kit Kat. Due for release next Thursday, 9th October, it will cost £130 - but will be available cheaper with Tesco Clubcard points. Internal storage is limited to 16GB but it's expandable up to 48GB with a memory card, while battery life is claimed to be up to 8 hours. On the back you'll find a 5MP camera and a 1.2MP camera on the front. A new parental filter comes pre-loaded on the tablet, enabling up to seven different users to use one device, with tailored settings based on age and suitability. The Hudl 2 also comes sporting a slimmer design and will arrive in eight different colours. Tesco is also throwing in a 'book of treats' which includes £60 of savings in Tesco stores. Michael Comish, group digital officer at Tesco, said: "Hudl 2 may be affordable, but we've cut no corners when it comes to performance - this is our best tablet offering yet."